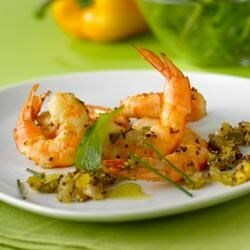 "Fresh shrimp with onion, bell pepper, and garlic in a mustard sauce are served atop fragrant garden herbs in this easy starter course." Place sunflower oil in a skillet. Add the onion, green pepper and garlic and cook for 5 minutes. Add the Maille(R) Old Style Mustard and cook for another 2 minutes. Add the shrimp and cook 5 minutes more. Season to taste. Serve with a salad of fine herbs (chives, chervil, parsley, basil).